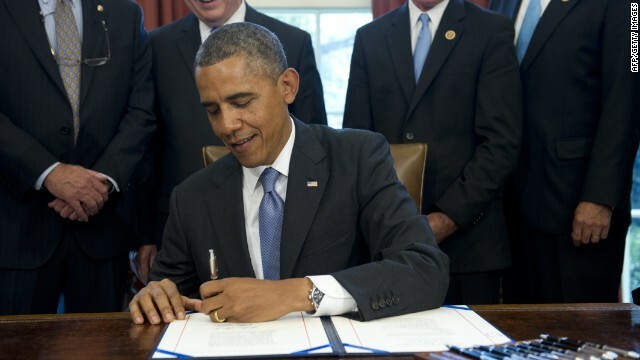 Washington (CNN) – President Barack Obama signed bipartisan legislation into law Friday that will temporarily reduce rates people pay on their student loans from the government. In the immediate, interest rates will go down to 3.86% for undergraduate students and 5.41% for graduate students. Obama and members of Congress have hailed the legislation, saying that it will save college students significant sums on their loans. The long-term savings for students are less clear however. The legislation allows for rates to go up with increases in market rates, with the undergraduate rate capped at 8.25%. Undergraduate rates had doubled from 3.4% to 6.8% July 1 after Congress failed to reach an initial deal. The House finally passed the new legislation 392 to 31 at the end of July after the Senate passed its version a week earlier. The new rates will apply retroactively to all loans taken out after July 1. College education should be free. These bogus universities like Harvard, Duke, Yale charge outrageously, even grads from these universities find NO jobs with huge bp debts for life-long. I see millions of unpaid student loans everyday on credit reports. Care to guess who the worst offenders are ???? Rick McDaniel Impersonator: obama just wants to control student loans so he can say he lowered taxes..... when actually its harder for everyone to pay their taxes since student loan rates have......decreased. Next....he will try to control all of our lives. I would like to understand why you are so removed from us? Do you ever ask the average person what they want from the government? People who sign up for courses at fly-by-night "colleges" that promise to train them to get a good-paying job in less than a year – training that high school vocational programs used to offer for free? You know, those "colleges" that will take any warm body as long as they can sign their X on the dotted line, generating a huge check for the "college" while knowing full well the training is inadequate, and half of those who start training aren't going to graduate? You do realize, don't you, that the only way to get out from under student loan debt is to die, that even a bankruptcy won't discharge the debt? The reason that a college education is so expensive is because the colleges and universities, like any other business, are going to raise prices until people are no longer able to pay them. I can't help but think, the President today just let these schools know that they can keep on increasing these prices. Jacquie, you are not required to take Obamacare! If you already have insurance, the only thing that might change is your rate you pay and it more than likely will go down. If you do not have insurance you are now required to get it. If you can't afford it, you can go thru a govt exchange to get it at a lower, affordable rate. Congress already has a plan. The same plan that all govt. Employees have. Its not free for them and never has been. google ACA and read the facts. Turn off Fox "spews" they are misleading you!